Home News iPhone 4 has finally been released, be first to learn about the great update! iPhone 4 has finally been released, be first to learn about the great update! We all remember endless noisy rumors and discussions about the release of iPhone 4, now i’m happy to inform that the date had already come and iPhone 4 has finally released. It turns out that new iPhone includes several additions in various aspects as video chat with FaceTime and high resolution screen, HD video recording and Multitasking capability, so lets discuss this biggest update in detail. People have been dreaming about video calling for decades. iPhone 4 makes it a reality. With the tap of a button, you can wave hello to your kids, share a smile from across the globe, or watch your best friend laugh at your stories via iPhone 4 over Wi-Fi. FaceTime works right out of the box — no need to set up a special account or screen name. In case you want to start a video call with your friend, just find her entry in your Contacts and tap the FaceTime button. If you want to switch off the video just tap the FaceTime button on the Phone screen. Either way, an invitation pops up on her iPhone 4 screen asking if she wants to join you. When she accepts, the video call begins. iPhone 4 has two built-in cameras, one on the front above the display and one on the back next to the LED flash. The front camera has been tuned for FaceTime. It has just the right field of view and focal length to focus on your face at arm’s length. So it always presents you in the best possible light. In addition you can share what you see with the back camera, simple, fast, and fun. Retina display’s pixel density of iPhone 4 is 326 pixels per inc, that makes text and graphics look smooth and continuous at any size. The pixel density is very high so your eye is unable to distinguish individual pixels and images in movies and photos are stunning at almost any angle. ﻿The iPhone 4 Retina display uses technology called IPS (in-plane switching). That’s perfect when you’re sharing photos with a friend or moving your iPhone around while playing a driving or flying game. Besides, Retina display offers four times the contrast ratio of previous models, so whites are brighter, blacks are darker, and everything is brilliant. Retina display glass is made from the materials that is used in helicopters and high-speed trains, accordingly it is more scratch resistant as it is chemically strengthened to be harder. The glass also features an oil-resistant coating that helps keep the screen clean. When you lift iPhone to your ear for a phone call, a proximity sensor immediately turns off the display to save power and prevent accidental dialing. iPhone 4 offers new way of multitasking allowing you to run third-party apps and switch between them quickly without slowing down the performance. To open recently used apps you just have to double-click the Home button without waiting for the app to reload. Apps can also remember where you left off and when you return, you can jump back whatever you were doing. The possibilities include listening to the audio, while performing other tasks (checking email, playing games). You can get Skype and VoIP calls and at the same time do whatever you like. For example, reading an email or checking for movie listing while having a voice call via Skype over internet. 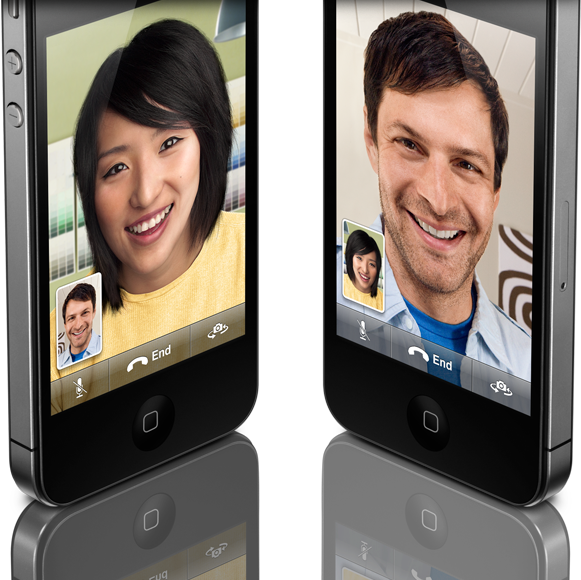 Receiving Skype or VoIP calls when other apps are running, even when your iPhone is locked is available as well. Apps that use GPS can keep running in the background as they update your position and give you spoken turn-by-turn directions even as you listen to music. It’s perfect for social networking apps, you and your friends can find each other even when you’re not actively using the app. App’s additional feature provides you with notifications such as: sports scores, news updates, game requests, reminders, alarms, without even opening the app and at the moment they happen. One more plus! While performing the task you didn’t have to wait around. In case you’re uploading picture you can switch to another app without interrupting the task. iPhone 4 has advanced backside illumination sensor that gives great video in both bright and low-light settings. With it’s built-in LED light you’re able to brighten the scene in dark environments. If you want to edit your video you can simply do it in the Camera without using your computer. Just drag to select start and end points on a filmstrip. Want to focus the camera where you want? Just tap the part of the image that you want to be focused. The camera immediately focuses on it and adjusts exposure to match the lighting. To focus on another part you only have to tap another part. Besides to the high-definition camera on the back, iPhone 4 has a VGA-quality camera on the front, above the display, that enables you to see yourself while you record. So it’s perfect for taking a video self-portrait without thinking whether you’re in the frame or not. Imagine you’re in the middle of a text message conversation and suddenly you see something video-worthy. Simply tap the camera icon in Messages to record on the fly and send it to your buddy via MMS. You can select some video as well from the Camera Roll and attach it to a new email message and send. Sync easily all the video you shoot on iPhone 4 back to your Mac or PC. The new iPhone will be available on June 24th. It comes in black or white, and with a new contract, costs $199 for a 16GB version and $299 for 32GB. The June 24th date is for the US, France, Germany, Japan, and the UK. The rest of the world will get it in July.